Girl of Stone is the second novel in the Expulsion Project series, and it was a great second book. I’ll be honest and say I didn’t enjoy it as much as I enjoyed the first book, but it was still a great read. The first novel introduced us to a wonderful cast and many brilliant planets, and this second book continues in the same way. The cast grows, introducing us to a number of characters that will leave us intrigued as to how their individual stories will play out. Certain characters from the first book are missing, and at first I felt their loss deep in my bones, but as the story progressed the empty space in my heart was filled by the new characters we were introduced to. The same is true for the world building. We came to really know the planets introduced to us in the first book, and with this second book we are introduced to a very different set of planets. They may be different, but they’re just as delightful. Although the cast and setting has changed somewhat, it is vital that you have read the first one before jumping into this story, as this story works to answer many of our questions from the first book. It is very much a connected series, where the overall story progresses with each book.In the first book we were introduced to many elements, and the same is true for the second book. As with the first book in the series, this one mainly focuses upon one main element. This element is what many of us have been interested in since the first page of chapter one – we want to know more about the planet our leading characters are from, we want to know what happened to their parents. Honestly, I’d expected to be holding out until the last book to receive the answer to these questions, so I was pleasantly surprised when things played out in the way they did in this book. I honestly had expected the events of this book to be very different, for the things that played out to happen in the final book. Not that this is a bad thing – it was just a surprise to me. I’m now expecting something very different from the final book, yet I’m sure it will be a wonderful conclusion to the series, as many big things are promised. I’ll admit to feeling as though some of the events in this book happened a bit quickly. We had all the vital aspects that we were introduced to in the first book – action, suspense, romance, questionable characters, and a number of other goodies – yet at the same time it didn’t hit me quite as hard as the first book did. Considering how the events in this book were bigger than the events in the first book in many ways, I feel as though the way things played out failed to pack the same kind of punch. Some things just seemed a bit too easy for my liking. There was such build up to what was to come, and then certain elements of the story seemed to be over far too quickly. I enjoyed the way things came together, yet I had wanted a little bit more from things.Overall, though, I really enjoyed this second book. I was given many answers and yet I still have many expectations for the final book. I’m expecting quite a bang for the last book in this series, and I cannot wait to see how things play out. "I voluntarily reviewed an advance copy of this book. All opinions expressed are my own. "Girl of Stone is the second book in Norma Hinken's Expulsion Project. We pick back up with the 4 surviving children of the Expulsion Project's brilliant scientists on their way to Mhakerta to hopefully rescue their parents. To do so they will have to find a way to destroy Preeminence, the AI harvesting the greatest living minds to feed it's own intelligence. The 4 consist of Finn, Ayma, Velkan, and Trattora. These 4 make the greatest possible team, each bringing their own strengths heightened by their unbreakable bonds. I love these 4 teens; their friendships and the young love between Velkan and Trattora are so satisfying. The fact that they can find moments to encourage one another, to show tenderness, to offer support when one of them falters makes me love them even more. Their vulnerability, compassion, and kindness are such a contrast to so much of the universe they live in. Norma has created such a fantastic world with these books. Each planet is so detailed; the people, their appearances and cultures, the animals, the plants are all described in such vivid detail it brings them to life. The story is well written and fast paced. There's so much suspense, so many ssurprises. It's a very intelligent book. You can't help but get caught up in the exciting journey. And because it is intelligently written their adventures are exciting, not ridiculous. They get in tight spots, but manage time and time again to find a way out of the mess. Once on Mhakerta though, they will need each team member to be at their best and a lot of luck thrown in. If you enjoy science fiction then this is the book/series for you. So full of twists and turns it will keep you holding your breath until the very end where you will discover not a cliffhanger, but another adventure. I can't wait to see what challenge the 4 are up against next! After I read the first book in this series, Girl of Fire, I fell in love with this authors books and the way she writes so I was super excited to read this book and I was definitely not disappointed!!! This is an author that can compete the the best writers in the world!! !This story follows on from the first book so you do need to read the first book to fully understand the world that the characters are living in with all the politics and the danger of their lives. I love how much this tale is filled with action, it is such an exciting and thrilling adventure of a tale that you will not want to stop reading, that will reel you in from the first page!You will join the characters from the first book once again in their adventure and meet new people that go way beyond your imagination! I live how you really start getting to know the characters in this book and you really see what motivates them along with their fears and their dreams! This really is an amazing,ING book and I highly recommend this author's work, it really is outstanding and I can't wait you read more of her work!!!! I adored the first book in this series, Girl of Fire, and have been hoping that book 2 would be as much fun. It more than exceeded that bar. This is a great romp of s story with a complex layered plot, thrills and action, betrayal and success, and even budding romance. The main characters (aka The Four) are wonderfully built and a true to pleasure to follow along as they continue to develop in the face of space pirates, their ultimate enemy psychotic AI, and everything else thrown at them. Add in a great supporting cast, Fruend and foe, and a great (and again very well written) plot. The result is another real winner. Highly recommended and I can't wait for the next book. Book 2 picks up where Book 1 left off and thrusts you right into non-stop action and adventure. Tratorra and her new friends are on their way to their home planet to find and rescue their parents. Of course things don't go smoothly for the group as they run into several obstacles, but they are determined. I love Norma Hinkens writing style and her ability to completely draw me into the story. I am especially appreciative of the fact that the language is not crude and the romance is not inappropriate. I am eagerly anticipating Book 3! Picking up after the end of book 1, Trattora and her friends are heading towards their birth planet. Things don't go as easily as they plan, but these kids are so amazingly strong. Together they can face anything and over come any thing in their way. There was so much about this book that I enjoyed. Trattora, Velken, Ayma and Phin are know as The Four on Mhakerta and they plan to free not only their parents but the whole planet. I liked the twist at the end, and can't wait to read the next book!! Norma Hinkens has done it again!The mission is on, save their birth parents, if they still live... What will they find on their birth planet?Don't miss this series! 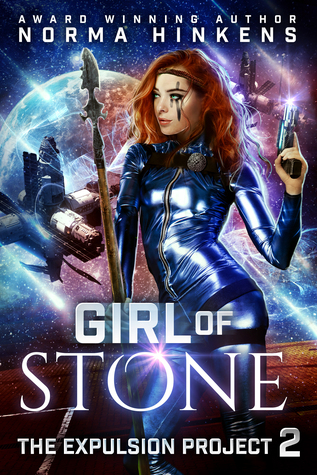 Girl of Fire sets the stage, and Girl of Stone follows it seamlessly, with a strong plot and well developed characters.I received a complimentary copy of this book and freely give my honest review. GoodGood but not as good as the first book which was much more original and organic. This one was kinda rehashed story in other books. However, it was still entertaining read. Just another great story by a fantastic author, who just keeps on writing fantasy stories to keep everyone satisfied. Just love all the books in the series. Pretty good! Action packed, a little contrived, but exciting and hard to put down. Suspenseful! A thrilling novel that held me captive from the first book. Girl of Stone picks up where Girl of Fire left off. The characters grow on me more and more each time I read. This book was such a high risk that it was hard to put down for a second never knowing what was going to happen next. Just when I thought I had things figured out the author threw in a twist. I can't wait to see what happens next.I voluntarily reviewed an arc from the author. Can a Self-Actualized AI be Stopped?Trattora has managed to find the other three members of The Expulsion Project and they are off on an adventure to their home planet, Mhakerta. Mhakerta was taken over by a self-actualizing artificial intelligence known as Preeminence and its citizens are now prisoners. Marauders, pirates, human traffickers, and more do their best to keep The Four, as they have become to be known, from getting to Mhakerta and finding their birth parents. Then there is the challenge of battling Preeminence.Hinkens second novel in The Expulsion Project, Girl of Stone, is even more exciting than the first book. There is non-stop action and layers of twists that keep you reading straight through until the end. The heroine, Trattora, is constantly struggling to do the right thing and not get them all killed without the council of her best friend, Buir.This is a young adult, dystopian, space opera. The ending smacked me upside the head. It was indeed a shocker. Can’t wait until the next book!5 out of 5 stars.I received this book for free from the author for review consideration. This in no way affected my opinion of the book, or the content of my review. On the planet Mhakerta, the artificial intelligence Preeminence is extracting human intellect, controlling the people and resources to do its bidding. Preeminence has forced three of the founding members of the Expulsion Project -- all scientific geniuses -- to work for it. Together, they are secretly working on a virus to shut it down, but the superior A.I. has knowledge beyond even their capabilities. Meanwhile, the four children of the Expulsion project have stolen a Syndicate ship in hopes of traveling to their birth planet of Mhakerta, finding their biological parents and freeing the people from Preeminence. Even the best of plans can go awry -- one wrong step can be the difference between life and death. Strong and capable, fans of Katniss Everdeen, will have a new heroine to cheer on in Tratorra as Norma Hinkens ups the ante in GIRL OF STONE. A Dystopian Sci-Fi thriller filled with action packed scenes, high stakes adventure and deceit. An enjoyable read that stands out against the overdone mediocrity of young adult fiction.I received an advance copy of this book in exchange for an honest opinion. Girl of Fire introduces you to the fiery-haired and tempered Trattora as she leaves her simple home world of Cwelt and embarks on a high-stakes mission across the galaxy to find her birth parents. Girl of Stone takes those stakes and raises them even higher in an epic YA action adventure story! The four survivors of the Expulsion Project begin a journey that will take them to Mhakerta and their birth parents. But along the way they will face space pirates, alien jungle cats, body poachers, an army of robots and an AI the likes of which the galaxy has never seen before. Elements of a heist/spy story show up when they finally arrive on Mhakerta and have to go undercover under the watchful eye of Preeminence.The book contains a team dynamic with the four of them that I love and my favorite character was Phin, the soldier. I also liked the choices Trattora and the others were faced with when trying to escape the body poachers. All-in-all it was a fun sci-fi read that anyone can pick up, whether you are a sci-fi fanatic or new to the genre. The ending was a perfect combination of bringing some of the plot full circle, while also leaving you on the edge of your seat wanting more! I highly recommend both the books in the Expulsion Project series and cannot wait for the third one to come out!I voluntarily reviewed an ARC of the book, but this did not affect my opinion or review. If I didn't like it, you would know. This is the second book in The Expulsion Project series. I found it to be very suspenseful and hard to put down. The development of the main characters moved along very nicely and smoothly with each of the characters finding their fit in the group and their strengths. As this book ended with a cliffhanger, I am really looking forward to the third book in the series. The second book in The Expulsion Project series brings us back to the life of Trattora, Velkan, Ayma, and Phin as they try to rescue Mhakerta from Preeminence. I found this book to be just as well-written as Girl of Fire was.